The Unified Messaging feature allows you to retrieve voice messages via the Voicemail page on the My Phone dashboard, or via email. Voice mails are sent in.wav format. Optionally, notifications can be sent to a mobile phone via text or email. *Please Note: Site administrators can setup users in the My Phone portal as well as on My account portal . Ask your site administrator if you do not have access into either portal. The following topics will help you with common My Phone related questions. 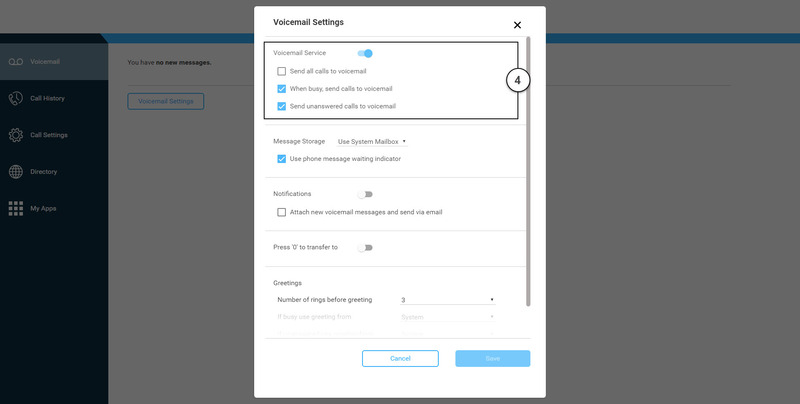 How do I configure my Unified Messaging? A. How do I configure my Unified Messaging? Login to the My Phone Portal. You will be brought to the My Phone Dashboard with the Voicemail page being the first thing you see. 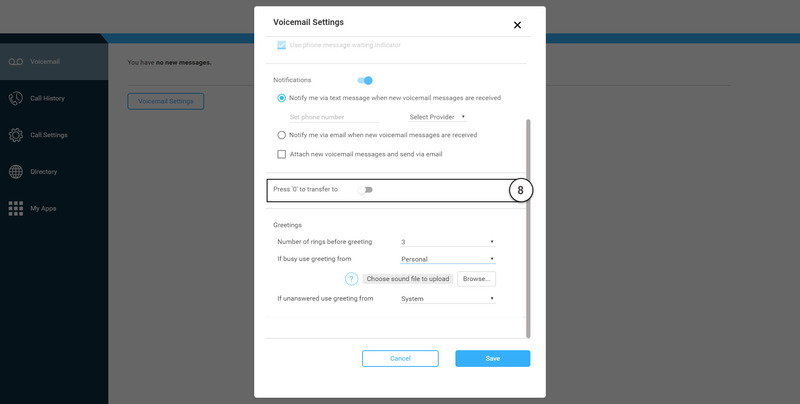 Click the Voicemail Settings button. The settings window should appear. Please Note: By default, the last two options are set to on. Under Message Storage, select System Mailbox if you want messages accessed via phone or the My Phone dashboard. If selected, check Message waiting indicator phone, if applicable. Check External Mailbox if you want all messages sent as a .wav file to the email you enter in the E-Mail Address field. 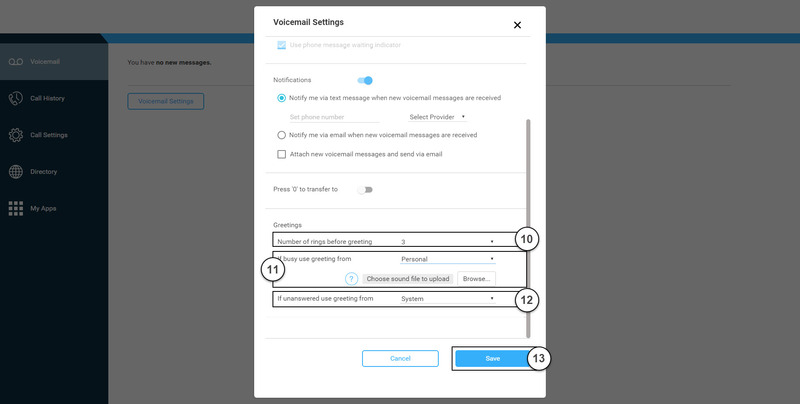 Notify me via text when a new voicemail messages are received – To receive text message notifications of voicemail messages. Enter the mobile number and select the wireless provider from the drop-down list. 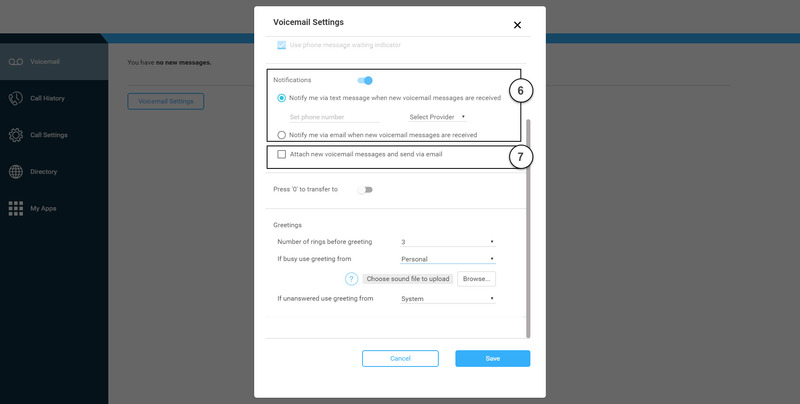 Notify me via email when a new voicemail messages are received – To receive an email notification of a voicemail message. Enter the email address that should receive an alert when there is a message (voice mail and fax). Please Note: This is only a notification of a voicemail. This is not a copy of the actual voicemail message. Check Attach new voicemail messages and send via e-mail and enter the address, if you would like a copy of the message to be sent in a .wav format to the e-mail address entered. Check Transfer on 0 to and enter a phone number where callers can transfer from voice mail by dialing 0, if applicable. If enabled, enter the destination to which calls should be transferred. Click the Upload button and browse for the file on your computer. Please Note: All Voicemail greetings must be formatted as CCITT U-Law, 8KHz, 8-bit mono attributes as a .wav file.